Theresa May is clinging to power thanks to the support of one of the worst elements in UK politics: the far-right Democratic Unionist Party. Last week’s snap election in the United Kingdom represented an extraordinary victory for the Labour Party’s left, which has been engaged in an internecine battle against its parliamentary right since the 1920s and the heyday of the Independent Labour Party. Indeed, the Blairite barbs against Jeremy Corbyn were all too similar to the attacks on the Maxtonites in the thirties and the Bennites in the seventies and eighties. Despite this infighting, Labour returned a historic result: thanks to a daring anti-austerity manifesto, Corbyn delivered a resounding victory for his party. Coupled with a diminished but still robust vote for the Scottish National Party (SNP), and a historic breakthrough for Sinn Féin, Labour’s victory and the election represent a broad mandate for the anti-austerity left. Though the Left has been rightly celebrating these results, we cannot ignore the monster the election has revived. At least for now, the Tories are clinging to power with the support of the Democratic Unionist Party (DUP). The loose agreement between these two parties will give unprecedented influence to one of the worst segments of British politics. Founded by conservative zealot Reverend Ian Paisley, the DUP most closely resembles the racist blood-and-soil fascism of the British National Party and the European far right. Paisley first came to prominence by crusading against the faintest whiffs of ecumenism from Canterbury or Rome in the 1950s. Over the next twenty years, he emerged as a hardline opponent of the Northern Irish Civil Rights Association as well as the power-sharing agreements aimed at restoring peace in the North. Paisley’s ideology has old roots: it builds on cross-class Protestant triumphalism designed to preserve settler-colonial supremacy in Northern Ireland. The Protestant bourgeoisie has worked for centuries to win over its once-radical underclass, characterized by millenarian theology and fervent republicanism. After the failed Irish Rebellion of 1798 — led by Ulster Presbyterians allied with Catholic peasants — economic dislocation and repression drove hundreds of thousands of religious and political dissenters to the United States. Those who remained either eagerly or abjectly turned to the British state, the landlord class, and the ultra-Protestant Orange Order for protection against eviction, unemployment, and famine. Chauvinism, repression of the Catholic minority, and the Protestant majority’s superiority became the core of loyalist politics, preserving the Ulstermen’s privileges at the expense of the so-called papists and Fenians. The architects of this cross-class, co-religious movement used an Ulster Scots mythos and a fragile sense of “Britishness” to ground their ideology. These far-right Protestants zealously support the crown and resolutely oppose Gaelic-Irish culture and Catholicism. The Ulstermen long feared that those they had expropriated would rise against them in violence, and they still conjure centuries-old Catholic massacres as living threats. These loyalists also pride themselves on their heroic sacrifices for king and country, from the bloody British conquests of the seventeenth century to the horrific casualties at the Somme . The party annually reinforces its followers’ feelings of supremacy during marching season, which commemorates the end of the Stuart dynasty in 1689 at the Battle of the Boyne. Followers hold triumphalist parades that target Catholic communities and burn republican effigies. Class politics have, on occasion, broken through this sectarian schema. The 1907 Belfast dock strike built a short-lived alliance among working-class residents, and, in the 1920–22 pogroms, Protestant socialists and labor organizers — pejoratively called “Rotten Prods” — were ejected from the shipyards alongside Catholics. Nevertheless, a patronage system, at times backed by murderous collusion between paramilitaries and the state, has effectively maintained the “carnival of reaction” that James Connolly predicted the North would experience after the partition in 1920. Most recently, the DUP has focused on socially conservative policies, borrowing heavily from the Southern US evangelical playbook. (Bob Jones University awarded Paisley an honorary degree in 1966.) Today, the DUP fiercely denies climate change and opposes reproductive rights and marriage equality. 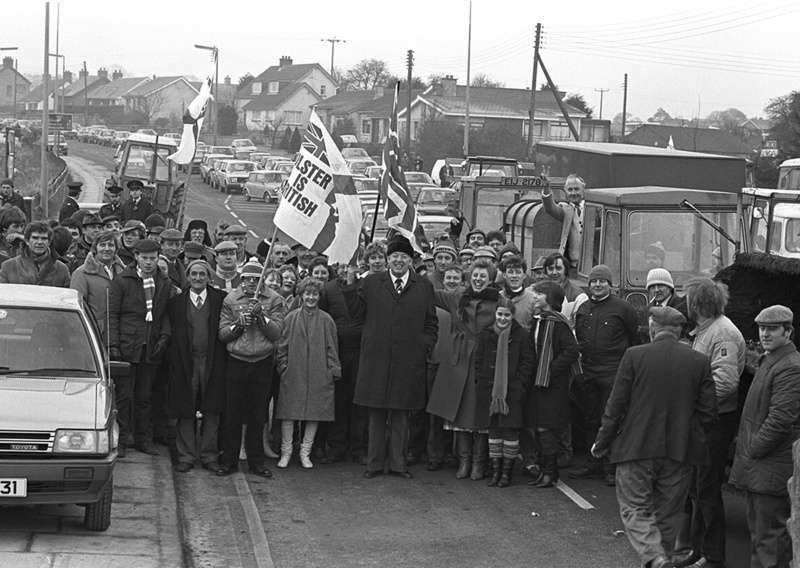 Party members publicly express their revulsion at the latter: the wife of former first minister Peter Robinson characterized it as “disgusting, loathsome, nauseating, wicked, and vile.” The party not only supported Brexit, which the Ulster Unionist Party, Sinn Féin, the Social Democratic and Labour Party, and the Alliance Party all opposed, but it also served as a conduit for illegal pro-Brexit funds during the campaign. Indeed, their dispute over the Anglo-Irish Agreement notwithstanding, Thatcherism and the Tory right-wing have always held allure to DUP politicians lusting after the lost “grandeur” of the British Empire. Most Northern unionists categorize Irish Catholics as among Kipling’s “lesser breeds,” those who require imperial discipline; today their hardline descendants fly Israeli flags in their housing estates, emphasizing their continued support for colonialism and oppression. The DUP’s politics haven’t changed since its founding, but now its ten members of parliament are poised to wield a frightening level of influence. Their votes will prop up continued Tory rule, but they are not bound within a coalition agreement. They will undoubtedly use this position to awful ends: to see that Northern Ireland exits the European Union without special status, to maintain vicious austerity policies, to block any expansion of marriage equality, to preserve draconian restrictions on reproductive rights, and to keep the Northern Irish minister on their side. With the future of the Northern Irish assembly in flux, the DUP will have power inside a Tory government that may resume direct rule, creating a scenario in which fanatics will run roughshod over the Good Friday Agreement. We should cheer the election’s results. With a broad mandate for anti-austerity politics, a staggering youth turnout, and (hopefully) the final stake in the heart of Blairism, the future for the Labour Party and the British left appears bright. But while the Tories’ grip on power is tenuous, May secured it — at least for the moment — with a Faustian pact that we can’t let stand. Kerby A. Miller is curators' professor emeritus of history at the University of Missouri. Connor Lewis is a doctoral candidate in modern Irish history at the University of Missouri and former cochair of the Coalition of Graduate Workers.